Sacred fires constitute an essential part of life at the Starlight Centre. They are powerful transformation ceremonies, which transform through fire and nurture the soul. We come together to celebrate the Divine and find peace and harmony. Everybody is welcome to take part - there is no prior knowledge required. You don't need to book in; but please make sure you arrive at least 10 minutes early as we always start on time. 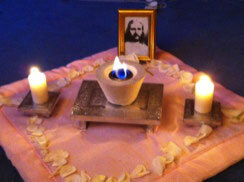 This fire is dedicated to Babaji, who is an embodiment of the Divine Mother. The holy fire burns away our shadows and brings light into all aspects of our self. 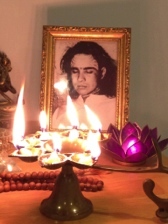 It is a very joyful fire ceremony during which we sing the Babaji kirtan. You receive the fire as a special blessing into your heart, followed by cleansing water. At the end, there are holy sweets, called Prasat, which in the tradition of hindu ceremonies are eaten to nourish the divine spirit within us. The Shakti Christ Fire originated from the tradition of the Essenes. 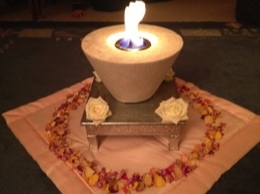 It is a very gentle and nurturing fire that helps everyone to experience their spiritual home. During the fire, we chant the mantra 'Om Shakti Christ Jay' 21 times. At the end, you can receive the warmth of the flame into your chakras. The red lotus fire is connected to the ruby red Christ fire and the white Christ light, strengthening and nourishing you. It brings a new energy quality to your root chakra. The red lotus fire brings more light from Heaven to Earth and anchors it. 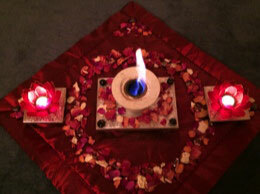 It is a fire ritual that helps you express your own light and experience yourself supported by the fire of love. This fire is dedicated to the Shakti energy, the pure female creation energy of the Divine Mother. It strengthens the Shakti energy within you and allows it to flow freely. Your female creation power returns to you, empowering you to live yourself fully without restrictions. The Shakti Fire supports Earth so that the female creation energy can re-take its hereditary place on Earth. In this heart-warming ritual you can experience the unity of fire and love as an expression of the light of Christ. The ritual awakens a new consciousness of Christ and the Divine in our hearts. It supports transformation and allows us to experience inner and outer freedom. Dhuni is a holy place of fire, in which Shiva and Shakti (creator and creation) unite. The fire represents Agni’s eternal love for all beings. 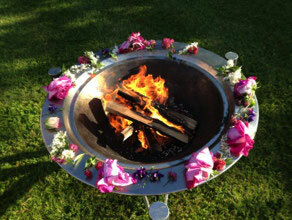 We can experience great healing during the ceremony, when we devote ourselves completely to the fire. Shadows, worries and pain can be burned away and we can receive happiness. The mantra “Om Namah Shivaya”, which we sing during the ceremony, nourishes the fire and ignites the holy fire within us.